A man with a faded, well-worn notebook open in his lap. A woman experiencing a morning ritual she doesn't understand. Until he begins to read to her. The Notebook is an achingly tender story about the enduring power of love, a story of miracles that will stay with you forever. Set amid the austere beauty of coastal North Carolina in 1946, The Notebook begins with the story of Noah Calhoun, a rural Southerner returned home from World War II. Noah, thirty-one, is restoring a plantation home to its former glory, and he is haunted by images of the beautiful girl he met fourteen years earlier, a girl he loved like no other. Unable to find her, yet unwilling to forget the summer they spent together, Noah is content to live with only memories. . until she unexpectedly returns to his town to see him once again. Allie Nelson, twenty-nine, is now engaged to another man, but realizes that the original passion she felt for Noah has not dimmed with the passage of time. Still, the obstacles that once ended their previous relationship remain, and the gulf between their worlds is too vast to ignore. With her impending marriage only weeks away, Allie is forced to confront her hopes and dreams for the future, a future that only she can shape. Like a puzzle within a puzzle, the story of Noah and Allie is just beginning. As it unfolds, their tale miraculously becomes something different, with much higher stakes. This is a sweet story, filled with love and passion. 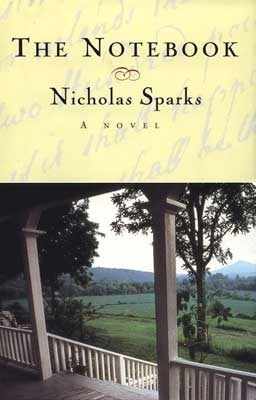 I like reading Nicholas Sparks books at the end of the month, because they're more peaceful than the others. It's about real life with a relatable story that leaves you thinking about life. The characters here are very interesting because we get to see them in different times. Still, it doesn't make the story confusing. We learn about their separate lives as well, even when it's more focused on their life together. I know it's sort of love at first sight, but it's a little different, because I believe the attraction is what comes first and everything else is what the character wishes would happen. Even though all of his books are set in North Carolina, I feel like there's always some place new we haven't seen, in every story. "Perfect love did that to a person, and this had been perfect." "Everywhere he looked, he saw her image, saw things that brought her back to life." "We fell in love, despite our differences, and once we did, something rare and beautiful was created." I know that the movie was spectacular and books are generally better so I bet this one is great. I loved reading your review of it! I think you are right about the love at first sight in this one. Jaclyn @ JC's Book Haven. Oh, I don't know if I'll ever be in the right place to read this one. It's weird how I wish I had different tastes and different reactions to books, but this one will send me into a re-reading binge like no other. I've heard many talk of this one, and the movie too. It's a lovely story and well done. I don't usually read real world set books (I try to escape the real world) but this sounds like a very good one. :) Thank you.